Last month, Eric Cordingley sent an update on his search for Morningside Hospital patient burial sites. He’s using records from the National Archive 2 and the Oregon State Archives (death certificates) to identify the cemeteries. Unfortunately, the graves are difficult to locate because the cemeteries no longer have records of the burials. In October, Eric had located the cemeteries where 145 Morningside patients were buried. He now has information on the burials of 200 patients! Check out the Morningside Hospital Virtual Cemetery. And thanks, Eric, for your continued commitment and hard work. 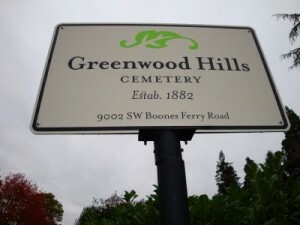 I met with Mary, the archivist for Greenwood Hill Cemetery and have the following to report: Burials of Morningside patients at Greenwood Hills Cemetery (GHC) began in February of 1942 after GH opened a new section. Morningside burials were mainly placed in Sections 7 and 8 which is a narrow strip of land between the G.A.R. Cemetery and the ravine. It is currently unknown how many burials took place in those sections of GHC. Sections 7 and 8 today are overgrown and/or wooded. Section 8 may not contain many burials due to the fact that the ground is saturated by a nearby spring. A recent attempt by a landscape company to clean up Section 8 ended when the equipment they were using became mired in the mud, even in late summer. There are Morningside burials in other sections of GHC which, though recorded, have yet to be documented. As far as can be determined, the last Morningside patient to be interred at Multnomah Park was Reinhard Effinger, who died 5 Feb 1942. His marker has been located and documented. No Morningide patient who died after him can be located and documented at Multnomah Cemetery. The first patient to be interred in Section 7 of GHC would have been Serge Samsonal. All subsequent burials of Morningside patients took place at GHC. Serge Samsonal, Archie Brown, James Ebena, Charlie Waters and Charles Neiman are listed on the database for Multnomah Park, but the locations given for their burials are either non-existent or were full prior to their deaths. James Ebena is listed in the Multnomah Cemetery database as being interred in either F, 91 or F, 191. However, F, 91 was filled by 1925 and according to cemetery records, Section F, 191, although platted for burials, was never used. The fact that F, 191 is part of an access a road underscores this fact. It is my belief that graves for the above-named persons were arranged for and entered into the books of the cemetery but the place of interment was changed when the weather improved enough to deliver the bodies to GHC. I also had an opportunity to spend time with the records at Riverview Cemetery. Interments of Morningside patients at Riverview began with Max Schmidt who died in May of 1923 and ended with Elizabeth Lyon who died in May of 1926. The section of the cemetery used for Morningside interments, Section 113, was severely damaged in a mud slide in the 60’s as has been previously reported. Several Morningside patients were interred in other Riverview locations that were not affected by the slide. Inspection of those sites will occur soon weather permitting. Attached hereto and incorporated herein by reference please find the Excel spreadsheet for the Morningside burials. This spreadsheet is far from complete but it reflects the material found in the quarterly reports and info from death certificates obtained from the State Archives in Salem. You will note that the earliest burials in the spreadsheet are not documented. This is because the location of the early interments, Rose City Cemetery, has not been very helpful in this discovery process. I think this is mainly due to the fact that their burial records are not digitized and thus a large request for burial locations could take a large amount of staff time. With some of the patients, we simply do not know what became of their remains. If the mortuary that handled the remains is willing to assist in this discovery process then those mysteries may be solved. I am indebted to the individuals who assist in this research: In addition to Ellen, Sally and Robin, my local assistants are Mary at Greenwood Hills; Burt at Riverview and Dave, my partner-in-research at Multnomah Park.